Casual style and great comfort come together in this double reclining sleeper and chaise sectional sofa. 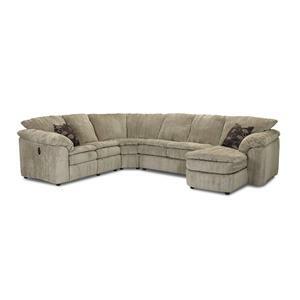 Easy going elegance comes to life in this versatile and comfortable reclining sectional sofa. Extra large, wide pillow arms add extra comfort and support. One end of this sectional couch features a love seat with two reclining seats that is great for kicking up your feet to relax. The other end has a chaise that is perfect for lounging on in front of the TV to relax or with a good book. There is also a pullout sleeper sofa that is provides you with great functionality, so that hosting overnight guests is easy and convenient. Created from individual modular pieces, this sectional is just one of numerous configurations that can be created, so you have the ability to choose the pieces you want that give you all the features and options you need, and nothing you don't. Available in over 1,500 fabrics and 300 leathers, you have the ability to pick the textures and colors that suit your individual style and tastes. The Legacy Dual Reclining Left Arm Loveseat, Sleeper and Right Arm Chaise Sectional by Klaussner at Value City Furniture in the New Jersey, NJ, Staten Island, Hoboken area. Product availability may vary. Contact us for the most current availability on this product. 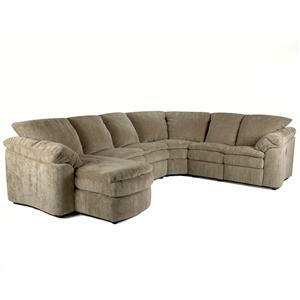 2703L DRLS Left Arm Facing Dual Reclining Love Seat 1 60" 40" 40"
KFIN-2702R-CHSE,BE/CO Right Arm Facing Chaise Lounge 1 38" 64" 40"
KFIN-2704-90SEW,BE/CO 90 Degree Corner Wedge Seat 1 67" 47" 40"
2705 IRSL Regular Innerspring Sleeper 1 66" 40" 40"
Arm Extra large pillow arms provide extra comfort and support. Leg or Skirt No visible leg or skirt. Offering incredible comfort with a classic casual design, this collection of upholstered living room furniture is perfect for any home in need of extra seating space. 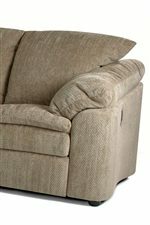 Featuring overstuffed wide pillow arms, pillow top seating, and a tight back design, this collection provides undeniable comfort and a great transitional style that will blend with any home décor. This collection provides both stationary pieces and modular sectional components that can be put together to create a larger sectional sofa with many different options. Flexibility and versatility are key, as these modular pieces allow you to choose the exact pieces and functionality that you need to create the perfect sectional sofa to fit your lifestyle and your home. Hundreds of configurations can be made, and since this collection is available in over one thousand fabric and three hundred leather choices, you are in total control to create a look that you and your family are sure to love for many years to come. 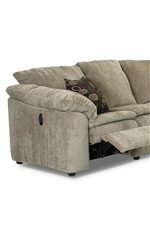 Comfort, functionality, and great versatile style come together in this collection of casual living room furniture to give you everything you need, and nothing you don't. The Legacy collection is a great option if you are looking for Casual furniture in the New Jersey, NJ, Staten Island, Hoboken area. Browse other items in the Legacy collection from Value City Furniture in the New Jersey, NJ, Staten Island, Hoboken area.